Ridge: My favorite in-park yet non-character meal spot is The Hollywood Brown Derby. It would have to be one of the best in-park places to get a steak, other than Le Cellier. The steak pictured is no longer on the menu but it was fantastic. It was served with a wasabi emulsion, soy reduction and a reduced pan sauce. The large yellow object was a fried plantain and the steak was cut on the bias and plated with smashed potatoes to hold them in their positions. But enough about those delicious morsels...if you're into that sort of thing. The Brown Derby is designed after the famous holder of that moniker, which is actually a chain in Hollywood, CA. The Brown Derby restaurants became synonymous with the golden age of Hollywood in the 1920s-1940s. Everyone who was anyone in show business went there. So at the Hollywood Studios the recreation of the original seemed only natural, back when it was a working studio, to bring a bit of class to the park. Lunch is served from 11:30-3:30pm and dinner is from 3:30- until park closing. One of the eye-catching new items on the menu is the Duck Two Ways: duck with a vanilla-white balsamic melon pear salad and a braised leg with a ginger-carrot puree and natural reduction. Loch Daurt Salmon sounds intriguing: glazed with Scotch whisky over arugula, watercress, local peaches, blue affine, walnuts and a fig and orange blossom honey dressing. Don't forget the signature desert, Grapefruit cake, yellow cake with layers of grapefruit cream icing. It is really good if you are into little morsels of deliciousness exploding in your mouth. 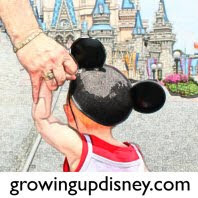 DisneyDad: Over the years my wife and I have had some wonderful and not so wonderful experiences at restaurants in the parks at WDW. My favorite place to dine is always the next place we have reservations. As menus are always changing, I'm always a little disappointed that my favorite dish from my last visit isn't on the menu this trip but then again there is always something new to try. On our last trip we had a very good experience at the Coral Reef Restaurant at the Living Seas Pavilion at EPCOT. We had a table for two next to one of the expansive windows that overlooks the aquarium. We dined on seafood as fish, sharks, turtles, and an occasional diver swam past our table. Another EPCOT restaurant we enjoy is Le Cellier Steakhouse at the Canadian Pavilion. The steaks here have always been excellent. Apparently I'm not the only one that thinks so as it can be difficult to get reservations here as it is a very popular place to dine. At the Studios I enjoy the food and ambiance of The Hollywood Brown Derby. The drawings on the walls are fascinating, taking you back to an earlier era of Hollywood. The last time we were here a pianist accompanied your meal with some old standards and Disney classics to help make your dining experience more enjoyable. At the Magic Kingdom Cinderella's Royal Table (aka King Stephan's Banquet Hall) use to be a wonderful place to dine. The atmosphere was wonderful and if you had late reservations, it was a fun place to watch the fireworks. It has been changed from a dining experience to just another character meal. Amy: I got my husband involved in brain-storming for this question and we came up with the following list: Tusker House, Mama Melrose, SciFi, Coral Reef, and Le Cellier. Tusker House: We went here for lunch last April. Other than date night at Jiko, this was our best meal of the trip. We’re big fans of Boma and this is pretty similar cuisine. My little girl ate better here than anywhere else. The grown-ups enjoyed the seafood stew, salmon, curry dishes, and the carving station with unique sauces for the meat. Mama Melrose: This was one of my husband’s picks. We went here for lunch in 2006 and were on the Disney Dining plan. He remembered a pleasant atmosphere, good iced tea, and solid Italian food. At the time, DDP gave us each an appetizer, entrée, and dessert. DisneyDad, Mom, Andy, and I each got something different and then we’d all try it. We haven’t been back but I also remember it fondly. Sci-Fi: I love this place. The menu is never quite what I expect but this is a case where the atmosphere trumps all else. It’s so much fun to go sit in the old cars and watch the cheesy science fiction B-movie clips. It’s usually my top pick at the Studios and I look forward to taking my daughter here. If you’re looking for a foodie experience, go to Brown Derby, but go to Sci-Fi for some unique fun. Coral Reef: This place has been hit or miss over the years. This was our last meal before heading for the airport on the 2006 trip and that time was marvelous. There were six of us and we had one of the large curved booths overlooking the ginormous aquarium. I still remember the lobster bisque, blackened fish served over grits, and the chocolate wave. The food was wonderful, the service was good, and the atmosphere was fun but refined and relaxing. Fast forward one year. My in-laws joined us for the annual October trip. I had planned everything as was so excited to take them to Coral Reef. The service was incredibly rushed, the food was not good, and it was too noisy for us all to talk. I was so embarrassed that I wanted to crawl under the table. I sincerely hope that was just a bad night since our first trip there was phenomenal. Le Cellier: My husband lit up when he added this one to the list. This was another Disney Dining plan experience and Andy and Chris were trying to see how much they could “spend” if we had been actually paying for the meal. They both had a great time and a truly delicious meal. I’ve been 3 or 4 times and I really enjoy Le Cellier as well but I feel that it is a little over-hyped in the Disney community. So that’s what the Growing Up Disney family recommends. What about you? What’s your favorite restaurant in the parks, excluding character dining? We also like Le Cellier. And Amy, I too think it's a little over-hyped as well but it is good. Unfortunately, since it will be a Signature in the future we will no longer be eating there. :( Hubby refuses to use 2 meals at one time. Boo. We also became fans of Sci-Fi during our last vacation and will be returning in Nov. I guess our other fav is Tony's Town Square. I do some research and plan our dinner when Spectro Magic will be going on. We've been able to sit outside while eating and view the parade for the past 3 vacations so I guess it's become a family tradition. Just wouldn't be the same if we didn't do it. The catch of the day with orzo is also pretty fabulous too. I respectfully nominate two epcot choices: the biergarten and rose and crown. The biergarten is unlimited sausage, really really big beers and an ompa pa band... could life get any better? Also, the rose and crown (i *heart* strongbow.... notice a theme of how I rate my restaurant choices?) is fantastic. Corby, I haven't been to Tony's in years but I may have to try it again. In the same way that Le Cellier has benefited from Disney fan hype, Tony's has suffered from it. I've never heard anyone on a podcast who likes Tony's. No, it's not Italian food of the century but I know other people who dine there on every trip. Both are also good choices. We go to Rose & Crown fairly often. Lecellier is good, although it's a pain to get a reservation, when you want. We did Tony's a few years back and loved it, just havn't been able to get a reservation that has fit our schedule this year or last, or we would have gone there again. I think people give it a bad review because it is always so busy and that affects the experience. If you have lunch there it's nice. We usualyy eat at Nine dragons and Rose and Crown in Epcot, my favorite in the Studios is Mama Melrose. Last year we ate at the Yak and Yeti, and thought was a great lunch. I will agree that LeCellier has some serious hype going on. However, I think it is deserving of the hype. Out of the 4 times I've eaten there in the past 3 years, all 4 experiences were excellent in every way. Also, I've never had a client who didn't have an excellent experience there. That said, I do not feel it is worth 2 dining plan credits. Better to pay out-of-pocket. Coral Reef. Now there's an interesting place to dine. My experiences have always been the same. Beautiful decor and visual ambiance. Good to excellent food (although surprisingly limited in seafood/fish choices). Way too noisy most of the time. Poor to average service. Call me biased about Tony's Town Square because I grew up in the NJ Italian subculture, but the food there is just not authentic. In fact, I find the food there to be even worse than chain restaurants such as Olive Garden. I'd also add The Plaza Restaurant to the list. I've always found the food there to be excellent, even if the menu is fairly common. Thanks James and Bruce! Way to defend your favorites! I am loving this discussion. James, I agree The Plaza is pretty good. While I doubt it's anyone's top pick, it's a nice place when you want something simple and prefer a quieter atmosphere than counter service.